Comfort is about more than making sure the temperature in your home or business is at the right level. You want to be comfortable with the people who are working on your HVAC system. We’ve been doing business in Colorado Springs for 27 years. We don’t do new construction. We focus on the HVAC needs of homes and businesses that are already occupied. In other words we deal with people. We work on both newer and older systems and even address nagging problems that have been there a while. And in doing that, we’ve saved a lot of Colorado Springs residents a lot of money. 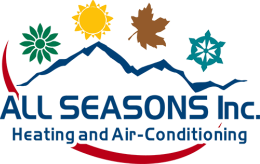 Comfort Starts At the Top: Tommy English, owner of All Seasons, is a native of Colorado Springs, and a second-generation HVAC professional. Most of the time you’ll find him in his All Seasons truck or on a job. When we talk about 27 years of experience, we’re talking about 27 years of hands-on experience in commercial and residential HVAC. You can be comfortable that you’re dealing with a company that knows exactly what they’re doing. Comfort Comes From the Right Staff: Our friendly and responsive office staff is ready to answer questions, provide you with the information you need, and to schedule your job. We’re easy to get in touch with and even offer 24/7 emergency services. With seven experienced technicians in the field, we have the personnel to put on your job when you need it. And our technicians are neat and courteous. You’ll feel comfortable having them in your home or in your place of business.